Donald Trump rallied in Nevada last night, and afterwards he chatted with reporters. During that confab, the President casually noted that Rep. Kevin Brady (R-TX) and House Speaker Paul Ryan (R-WI) are working on a "major tax cut for middle income people" in the next couple of weeks. "If we do that, it will be sometime just prior, I would say, to November," Trump said. One can never tell if Trump grasps the implications of his words or not, but this news is tantamount to announcing two things. The first is an admission that the original tax cut, which was advertised as being "for the middle class," was not. The second is that the GOP has officially realized that voters didn't buy the spin, and the Republicans would now very much like to use the government's money to purchase people's votes in the form of yet another hastily-passed tax "reform." It is nearly inconceivable that anything will actually happen before the midterms. First of all, there just isn't much time left. Second, Congress isn't even in session, having adjourned so members can campaign. And even if Ryan and Majority Leader Mitch McConnell (R-KY) call their colleagues back into session (after all, that pair has no need to campaign right now), it is very hard to believe they can find the support to quickly pass another massive giveaway, in view of this week's news about the exploding deficit. After all, if you start giving big handouts to the wealthy, and corporations, and the middle class, that leaves you balancing the budget on the backs of the poor, and poor people vote. Russia has violated the agreement. They've been violating it for many years. And I don't know why President Obama didn't negotiate or pull out. And we're not going to let them violate a nuclear agreement and go out and do weapons and we're not allowed to. We're the ones that have stayed in the agreement and we've honored the agreement. Some folks will be pleased to see the administration standing up to Vlad Putin. It's actually something of a surprise, especially since—despite Trump's slam on Barack Obama—the treaty was actually negotiated by St. Ronnie in 1987 (well, he signed it, at least). The unhappy news is that this particular instance of standing up to Russia will not make American elections stronger, or keep the Russkies from grabbing territory that is not theirs. No, it will have the effect of increasing the world's supply of weapons of mass destruction, which is not exactly an optimal outcome. Georgia Secretary of State Brian Kemp (R) has spent much of his time in office making certain to erase certain kinds of voters from the rolls. Yesterday, we noted that at least 600 absentee ballots, primarily from the very diverse Gwinnett County, had been tossed in the garbage for dubious reasons. And last week, we pointed out that 53,000 new voter registrations had been flagged on the judgment of Kemp's staff, with 70% of those belonging to black folks. So, something's rotten in the state of...well, Georgia. On Saturday, however, came news that the issue may be vastly more extensive than suspected. Like many states, Georgia has laws that govern the removal of inactive voters from the rolls. In their particular case, voters who have not cast ballots for three years receive a letter warning them that their registration is in jeopardy. If they do not respond, and they do not vote in either of the next two general elections, then they are purged. Generally speaking, this is a fairly reasonable means of dealing with the fact that when people die, change residences, etc., they (or their executors) rarely notify the government. The issue in Georgia, according to an investigation by journalist Greg Palast, is that of the 534,000 voters who were purged under the terms of the Georgia law in the last two years, more than 340,000 of those still live at the address at which they were registered. There are only two ways to explain this. The first is that an enormous number of people failed to respond to their legally-mandated warnings, and also failed to cast a single vote for four years. The second is that they were purged inappropriately. Palast has not released any demographic data about those who were purged, but he did imply that they were disproportionately black, which lends credence to explanation #2. It is the case that, barring some sort of court intervention that overturns the expurgation, folks will be able to cast provisional ballots. However, the decision as to which provisional ballots to accept, and which to reject, will be made by...the office of Brian Kemp. Gov. Bill Walker (I-AK) is the only independent governor currently in office. He got there because, during his first run in 2014, there was no Democratic candidate. So, he was able to cobble together a coalition of Democrats, independents, and moderate Republicans and eke out a narrow victory (48.1% to 45.9%). This year, however, there is a Democrat, in the form of former U.S. Senator Mark Begich. Neither Begich nor Walker had much chance against Mike Dunleavy (R) as long as they were both in the race, so it was something of a game of chicken to see which would be the one to drop out. Recent events served to end the game of chicken. Earlier this week, Walker's lieutenant governor and running mate, Byron Mallott (running as an I, but registered as a D), resigned from both his job and the campaign. The story remains hazy, but Mallott reportedly made "inappropriate overtures" to a woman. Who, and when, and of what nature are questions that are all unanswered. Anyhow, the scandal sucked Walker in, and so caused him to throw in the towel on Saturday. First of all, Senatorial Debates are happening all over the place. That includes meetings between Sen. Dianne Feinstein (D-CA) and Kevin De León (D) (Feinstein won), Sen. Tom Carper (D-DE) and Rob Arlett (R) (tie), Sen. Elizabeth Warren (D-MA) and Rick Diehl (R) (Diehl won), Sen. Debbie Stabenow (D-MI) and John James (R) (tie), Sen. Claire McCaskill (D-MO) and Josh Hawley (R) (tie, but both were impressive), Sen. Heidi Heitkamp (D-ND) and Kevin Cramer (R) (Heitkamp won, but both were impressive), Sen. Sherrod Brown (D-OH) and Jim Renacci (R) (tie, but both were slinging lots of mud), Sen. Bob Casey (D-PA) and Lou Barletta (Casey won), Sen. Maria Cantwell (D-WA) and Susan Hutchison (R) (tie), Sen. Tammy Baldwin and Leah Vukmir (R) (Baldwin won), Rep. Martha McSally (R-AZ) and Rep. Kyrsten Sinema (D-AZ) (Sinema won), and Sen. Dean Heller (R-AZ) and Jacky Rosen (D) (tie). Dianne Feinstein said this week that she will reopen the Brett Kavanaugh investigation if the Democrats take the Senate (which would make her chair of the Judiciary Committee). Sen. Chris Murphy (D-CT) is taking the lead in trying to hold Donald Trump accountable on Saudi Arabia. Since Murphy is a shoo-in for reelection, this is likely more about his 2020 presidential aspirations. Sen. Cory Booker (D-NJ) is campaigning in Florida for gubernatorial candidate Andrew Gillum. Florida does not get to vote for New Jersey's senators but, coincidentally, they are a very important swing state for would-be presidents. Skeletons from Gov. Rick Scott's (R-FL) past keep popping up as he tries to take Sen. Bill Nelson's (D-FL) job. The latest: The shady Puerto Rican electrical company that struggled to restore service after the hurricanes last year, and that got lots of financial support from Florida, includes Scott as a major investor. Shocking news, as it were. People searching Google for Hawaii senate candidate Ron Curtis (R), a political unknown, often get hits for the Carolina Panthers, who have a coach with the name Ron and a player with the name Curtis. This week, the #1 result is a ranking of actress Jamie Lee Curtis' movies, including the one ("Blue Steel") that she did with Ron Silver. If only Ron Curtis' campaign had some money, maybe he could hire a search-engine optimization expert. Either the Senator inadvertently stole the idea, or he's trying to show he's a sport (a la "sock it to me on Laugh-In"), or he's trying to subliminally plant the idea in the minds of his colleagues that he'd be an excellent Veep candidate in 2020. Part of the point of the aforementioned ad, by the way, is to allow the Senator to distance himself from his brother, whose company has been shipping American jobs overseas like it's going out of style. Elizabeth Warren has gotten absolutely lambasted for the DNA test she took that ostensibly proved her Native American heritage. The "stars" are campaigning for James in Michigan. And by "stars," WDIV Detroit means Kid Rock, Ted Nugent, and Donald Trump Jr. That may be "star power" in Michigan, but here in Los Angeles it barely beats the line at any decent Starbucks. Jim Newberger (R), who is trying to knock off Sen. Amy Klobuchar (DFL-MN), has refocused his campaign on illegal immigration. Minnesota, it should be noted, is about 1,300 miles from Mexico at its closest point. Karin Housley (R), who is struggling in her race against Sen. Tina Smith (DFL-MN), took another step backwards this week when it was discovered that she once wrote a Facebook post comparing Michelle Obama to a chimpanzee (specifically, Bonzo from "Bedtime for Bonzo"). Compare the number of politicians who have been substantially aided by Facebook with the number who have been substantially hurt, and the lesson seems clear: Stay off of Facebook if you're in politics. Conservative activist James O'Keefe, known for his dirty tricks, is at it again, having used hidden cameras to catch footage of members of Claire McCaskill's campaign saying impolitic things. The campaign wants an investigation, which would be the purview of...state AG Josh Hawley (aka, the competition). Also, Hawley has blasted McCaskill for traveling around the state in a private plane. Now, he's been caught doing the same. However, since he (unlike McCaskill) is not wealthy enough to afford his own plane, the one Hawley has been using belongs to a lobbyist. It is clear, given that Donald Trump has now held three rallies in Montana during this midterm season, that his desire to take down Sen. Jon Tester (D-MT) is personal. The reason for the tension is that it was Tester who really derailed the nomination of Adm. Ronny Jackson to be VA Secretary. This is underhanded, even by New Jersey standards. Republican Bob Hugin, who consistently trails Sen. Bob Menendez (D-NJ) in the polls, is now running an ad that falsely accuses the Senator of traveling to the Dominican Republican to engage the services of underage hookers. We are not going to give the ad oxygen by embedding it, but if you really want to see it, it's here. Menendez has plenty of baggage, even if it does not include young prostitutes. However, as much as New Jersey voters are unhappy with him, polls say that he's being saved by the fact that they hate the President much, much more. Corey Stewart (R), who is challenging Sen. Tim Kaine (D-VA), is in lock step with Donald Trump. That includes the murder of Jamal Khashoggi, which Stewart described as not significant enough to justify punishing the Saudis. Sen. Joe Manchin (D-WV) got several of the sorts of endorsements this week that shouldn't matter, but do, from basketball legend Jerry West, West Virginia basketball coach Bob Huggins, and Alabama football coach Nick Saban. Martha McSally (R-AZ) has two presidents campaigning on her behalf: George W. Bush and Donald Trump. Those are two very different kinds of Republicans; one wonders if it's not leaving voters a little confused about what McSally stands for. Rep. Beto O'Rourke (D-TX) is very good with social media. Sen. Ted Cruz (R-TX), who is 47 going on 90, wanted to show he's also hep, and rad, and down with the Internets. So, he tried to hold a Facebook live chat that, by all accounts, was a disaster. Jenny Wilson (D) is trailing Mitt Romney (R) among both men and women right now. Unless your campaign has a massive number of non-gender binary voters, that's a bad position to be in. There is a saying in football that if "you have two quarterbacks, you have none." That seems a somewhat useful way to think about this year's Democratic field, which has six or seven people who could be described as a "frontrunner," including this week's candidate. But maybe when you have six or seven frontrunners, you really have none. Full Name: Joseph Robinette "Joe" Biden Jr.
Background: Biden was born in Pennsylvania to a working-class Catholic family. His father, Joe Sr., was an enthusiastic entrepreneur, but not a skillful one, and so had a string of business failures. Concluding that the Keystone State was played out, the elder Biden decamped his family to Delaware when young Joe was 10, and got a job as a used car salesman (undoubtedly a useful model for a future politician to study). Joe Jr. was an outstanding football player, a strong student, and a popular fellow who was elected president of both his junior and senior classes. He took his undergraduate degree at the University of Delaware, dabbling a bit in civil rights activism, and then moved on to law school at Syracuse. He hated it there, got caught plagiarizing (anticipating a scandal from much later in his career), and barely squeaked by, graduating 76th out of 85 students. He did not engage in anti-Vietnam War activism, later explaining that he had a career to focus upon and a family to support. He avoided service in the conflict due to suffering from asthma. Biden's life has had more than its share of tragedy; his first wife and one-year-old daughter were killed in a car wreck in 1972, and his son Beau died of brain cancer at the young age of 46. Political Experience: Biden was an independent for several years because he disliked the economic program of the Republicans, but also the racial conservatism of Southern Democrats. He eventually threw his lot in with the blue team, though, and was elected to the New Castle County Council in 1969 on a liberal platform. Having boasted throughout his college years that he would be a U.S. Senator by the time he was 30 years old, Biden made good on his promise in 1972 (shortly before his wife and daughter died), becoming the fifth-youngest person ever elected to that body. He almost quit to take care of his now-motherless sons, but was talked out of it by then Majority Leader Mike Mansfield (D-MT). Biden put together one of the most distinguished careers in the history of the U.S. Senate, ranking not far behind giants like Lyndon Johnson, Daniel Webster, Henry Clay, and Robert LaFollette. In 2009, of course, he left the seat he had held for 36 years in order to serve as Barack Obama's vice president. Signature Issue(s): As a senator, his signature issue was working to reform the criminal justice system. In his capacity as chair of the Senate Judiciary Committee, he helped secure passage of the Violent Crime Control and Law Enforcement Act and the Violence Against Women Act, among others. As VP, he is most associated with healthcare. He helped shepherd the ACA through Congress, and was also assigned by Barack Obama to work on a "moonshot," namely finding the cure for cancer. Instructive Quote: "No one ever doubts that I mean what I say. The problem is I sometimes say all that I mean." 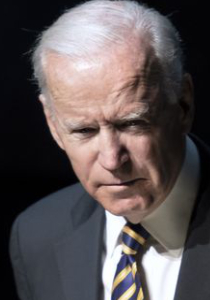 Completely Trivial Fact: In his school-age years, Biden struggled with a noticeable stutter, which caused his classmates to mock him as "Joe Impedimenta," and made him a target for bullies. He solved the bullying problem by learning how to box, and the stuttering problem by reciting poetry out loud in front of a mirror. Recent News: Biden has been busy on the campaign trail, holding rallies on behalf of any candidate in a swing state or an early primary state who wants him to do so. He takes each opportunity to get in a few shots at Donald Trump, most recently accusing the President of "shredding" American values. Three Biggest Pros: (1) If the Democrats decide that "win back white, working-class voters in the Midwest" is their 2020 strategy, there is nobody better to do it than Uncle Joe; (2) Similarly, if the blue team decides to "go low" and brawl with Trump in 2020, nobody is more ready for that than Biden; and (3) No candidate in the field (unless Hillary Clinton actually runs again) is better-connected to the Democratic establishment, and knows better where the levers of power are, than Biden. Three Biggest Cons: (1) Biden has run twice before and it went nowhere, so clearly he struggles to get anyone outside his base excited; (2) In particular, progressives will not be too happy about a septuagenarian white man who is as "establishment" as it gets; and (3) Biden's got a lot of baggage, given his loose lips, his willingness to bend the rules, and some of the policy positions he's taken during his lengthy career. The occasion in 1987 when he was caught plagiarizing a speech, the "Biden Rule" (that was later used to justify denying Merrick Garland a hearing), his treatment of Anita Hill during the Clarence Thomas hearings, and his vote in favor of the 2001 use of force resolution in Iraq all leap to mind as significant skeletons from his closet. Is He Actually Running? : Like most of the "frontrunners," he hasn't declared formally, but yes, he's running. For what it is worth, he is currently the preferred candidate of more Democrats (33%) than any of his competitors (easily outpacing second-place Sen. Bernie Sanders, I-VT, and his 13%). Betting Odds: The books are giving anywhere from 10-to-1 to 5-to-1 odds, which implies a 10%-20% chance of Biden's claiming the nomination. The Bottom Line: Biden is certainly a very serious candidate, given his strengths, but also the fact that the very wide Democratic field doesn't actually have too many people in his particular lane. There will be a half-dozen women competing for the "enough is enough" vote, and a half-dozen candidates of color competing for the "ethnic" vote, and a half-dozen west coasters competing for California (and the early lead that will come with its huge pile of delegates), and a half-dozen folks competing for the "progressive" vote. However, the blue-collar, salt of the earth Midwesterners are pretty much Biden and Sen. Sherrod Brown (D-OH), and not much beyond that. If nothing else, Biden is pretty much guaranteed a seat at the table for the grown-up debates (i.e., the primetime ones), and that is a forum that plays to his strengths...but also to his weaknesses. Oct19 Governors' Mansions: The Beacons of Democracy?